Earlier this week, we held our 2nd annual Teen Lifeline Fundraising Dinner & Auction, and I am still blown away by the generosity and support that come from this night. One of my favorite parts of the night came when Beverly Ross spoke truth over the audience. If you haven’t heard of Beverly Ross or Wise County Christian Counseling, I would encourage you to go check them out! Until she said this, I had never thought about the danger of saying, “It’s going to be okay!” When little kids are upset, we tell them it will be okay. When someone dies, we say that it will be okay eventually. In those teenage years, we talk about their future and that everything will be better – friends, parent relationships, school, drama, their purpose…the list could go on and on. But can we guarantee that everything will be okay? That things will get better? We cannot promise that their life will be perfect or happy or even “okay,” but we can promise the teenagers around us that when it gets hard, when life is less than okay, that they will have someone to walk with them. They are not alone. They don’t have to struggle by themselves. This is the power of Teen Lifeline Support Groups! More than anything, they provide a safe place for teenagers to talk about things that are both okay and not okay. They give perspective and understanding for other people’s struggles. They make sure that every teen participating has at least one adult and a group of peers to do life with. “Me too” implies understanding and acceptance. So, what do you think? 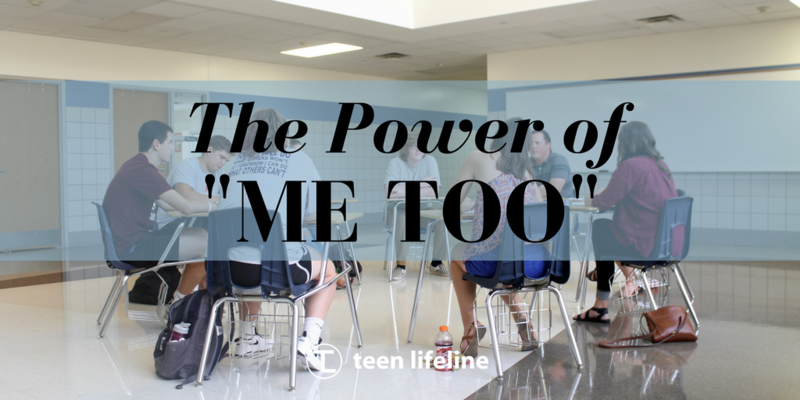 How has the phrase, “Me too,” impacted your life? What can we say instead of, “It’s going to be okay?” Share your thoughts and stories with us!